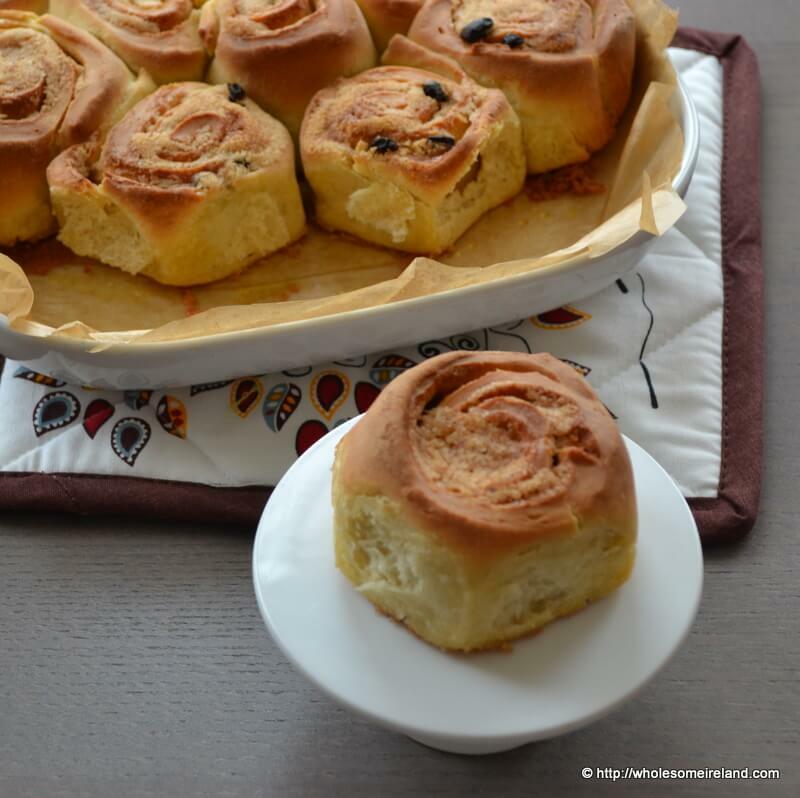 A few weeks ago my friend Deb posted a picture of some screen-lickable cinnamon rolls she’d baked. Seeing as she’s in Tipperary and I’m just outside of Dublin it’s not as if we can arrange a delivery so I decided to give them a go and bake them myself. 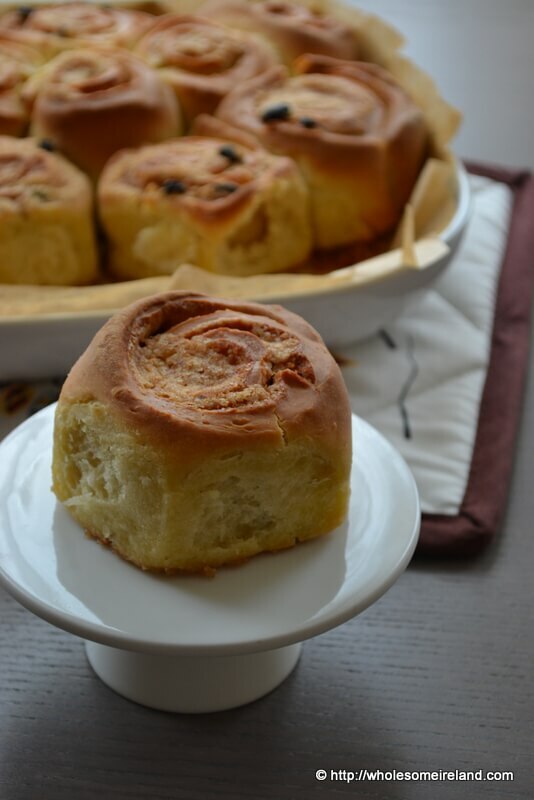 Making cinnamon rolls isn’t all that difficult as it’s simply a brioche (fortified bread) dough which is still proved twice, it’s just that the second prove is after it has been spread with cinnamon filling and rolled. Truthfully the biggest issue I have with this recipe is the time it takes because the kitchen is so small and my 2 year old is getting into/on top of/under everything these days, if the recipe in progress isn’t under lock and key it will end in tears. I used the basic Ballymaloe bun dough recipe from the Ballymaloe Cookery Course book. It’s one of the few books that I have on my bookshelf that is relatively new yet tattered and worn because I use it so much as a reference point. 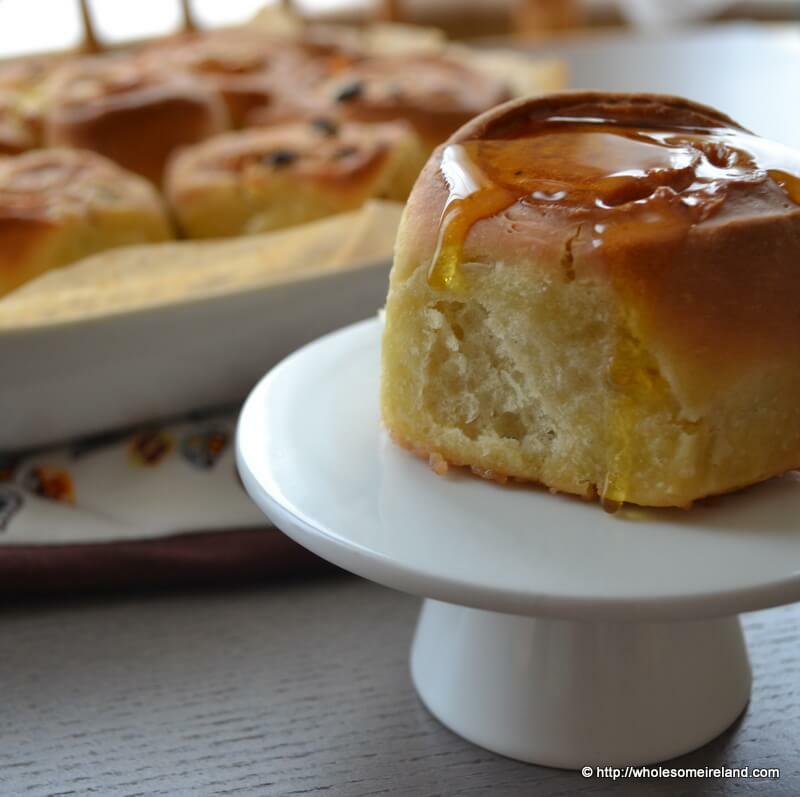 You’ll find the recipe here if you scroll down the page until you reach her “Chelsea bun recipe”. Darina makes some great suggestions for filling but I stuck with simple 100g of softened butter, 50g of soft brown sugar, 2 teaspoons of ground cinnamon, 1 teaspoon of ground ginger, a grating of nutmeg, handful of raisins and some lemon zest. Combine all these ingredients well with a fork. Then once the dough has proved for the first time, knock it back and roll it out in a rectangle. Liberally spread the filling all over the dough and then roll tightly before covering and leaving to prove in a warm place for a further 30 minutes. Slice into thick rolls, then pinch lightly at one end so that the filling doesn’t fall out into the bottom of the baking dish. Place the rolls into a heavy oven dish (lined or well-greased and dusted with flour), making sure they’re not too close together. Now heat a fan oven to 200 degrees Centigrade, the rolls will prove a little more while the oven is heating up. Bake for 25 minutes or until golden brown on top. Leave to cool on a wire rack before separating. For a glaze, I cheated and drizzled a little warmed golden syrup on top just before serving. The cinnamon rolls lasted 2 days here and the 5-year-old brought one to school for a treat on Friday.